← Your not agile if you are just parroting! The one is for Brad – conversationalist, satirist, humorist, historian, logician, craftsman, military strategist, but most important of all – my friend! Despite agile’s wide popularity across all business sectors and organization sizes, companies today still struggle with organization agility. 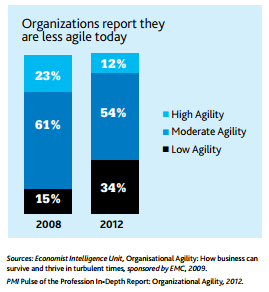 A 2012 report in the Economist claims that organizations are reporting they are less agile today. In fact, over a four year period, the number of organizations that reported they believe they are highly agile was almost cut in half from 23% to 12%. Worst still, organizations that reported they had low agility, more than doubled, from 15% to 34%. What is going on here? Are we actually loosing ground with being agile? Why are the deltas so great and in the negative? The study in the Economist Intelligence Unit points to the quality of a company’s change management effort as the key to their success in organization agility. Admittedly, the statistics have an impressive correlation. However, it is easy to misinterpret the meaning of this report. First, we should realize that organizations had a more in depth and sophisticated understanding of what organization agility was in 2012 than was previously known in 2008. If you doubt that just look at the amount of change in technology and new business structures that have emerged since 2012. With this stricter standard, business are rightly judging themselves more harshly as they realize the importance of being agile in more than just name. Second, the definition of change management has fundamentally changed. Previously, change management had a philosophy of controlling and inhibiting change. 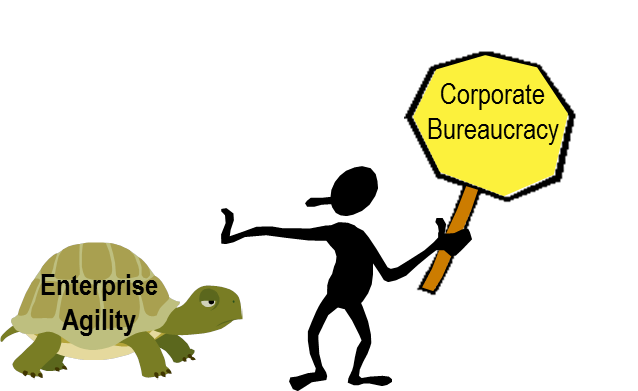 This added to the inertia of many organisations by creating bureaucracy and unnecessary and complicated procedures. Today, change management is proactive in encouraging change and seeking out new opportunities that the business can leverage. That is one of agile’s key principles. Ultimately, I believe organizations are considerably more agile today than they were in 2008. If they weren’t they would be out of business in this challenging and changing economy. So, I encourage all my friends and readers to redouble your efforts at Keeping Agile! This entry was posted in Agile and Strategic Planning, Agile Arguments, Agile in the Enterprise, Agile Thinking, Uncategorized and tagged Agile, Agile Adoption, Agile Thinking, Agility, Business Agility, Business Management, Innovation, Keeping Agile. Bookmark the permalink. 5 Responses to Are Organizations Really Less Agile Today? The is however, considerable calcification in some people’s craniums or in other words, they are rock heads. It is a shame that those who are incompetent and in authority are allowed to protect their positions by opposing improvement. Of course, their management is equally incompetent! From my perspective – no – certainly not!!! The old bloated, stuck in the mud businesses are dropping like flies!!! Daniel some are some aren’t it all depends. I love Brian’s approach to this question though. Nice post Brian! This was a good start for me in covering the state of agile in businesses today. I recently took over the software development responsibilities at a 100 person company and needed to get a handle on agile and its adoption. Your blog has been a great help.